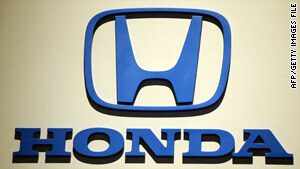 Honda recall related to airbags now expands to more than half a million worldwide. (CNN) -- Honda has expanded an airbag recall worldwide to more than half a million vehicles. The recall covers 2001 and 2002 Accord, Civic, Odyssey, CR-V, and selected 2002 Acura TL vehicles, the automaker said. One Honda Pilot model and one Acura CL vehicle might also be affected, a spokesman said. On its Web site late Tuesday, Honda said the driver's airbag inflators might expand with too much pressure, which can cause the inflator casing to break and could lead to injury or death. There have been 12 incidents related to an airbag inflator problem, Honda said. The original recall was issued in July 2009, and included 2001 and 2002 Accords and Civics, as well as some 2002 model year Acura TL vehicles. The global recall now covers 514,000 vehicles.